It’s April. We’re overdue for a cake recipe, yes? 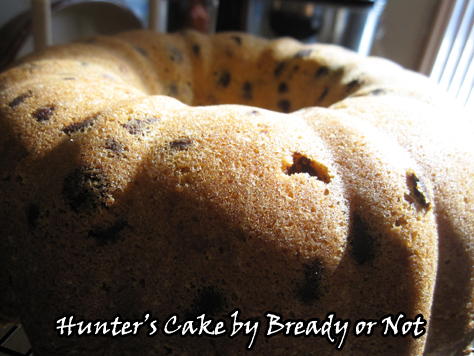 How about some Hunter’s Cake? This is a cake that’s designed for some fantasy-style questing. The crumb is tender to eat but dense, so it doesn’t crumble much. There’s no frosting, no fussiness. Wrap up slices of this cake to go in a lunch box, a picnic basket, a backpack, or Hobbit’s leather pouch. Use whatever kind of chocolate you want. I used milk chocolate, because that’s what I tend to keep around. 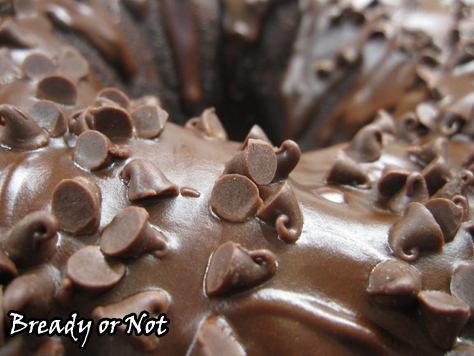 Whatever kind you use, be sure to coat the chocolate chips in flour before you add them to the batter. That will prevent them from sinking. This cake is perfect to eat right out of hand. No fork required. Modified from Rescued Recipes by Jan D’Atri in the Arizona Republic. This dense, pound cake-like cake is named Hunter’s Cake because it’s great to slice and pack for adventures. It doesn’t crumble much, and it’s delicious out of hand. Modified from Rescued Recipes by Jan D’Atri in the Arizona Republic. Preheat oven at 325-degrees. Grease and flour a Bundt pan, tube pan, or angel food cake pan. In a large bowl, beat together the shortening, sugar, vanilla, and salt. Add eggs one at a time until smooth, followed by most of the flour. 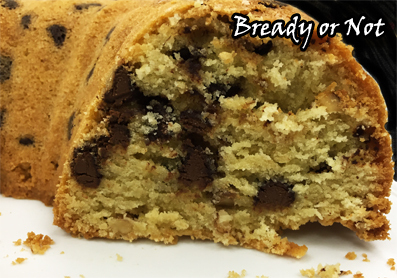 In a small bowl, stir together the chocolate chips and remaining flour; this is important, as it will keep the chips from sinking in the batter as it bakes. Stir the floured chocolate and walnuts into the batter. Spoon the batter into the prepared pan. Bake for 55 minutes and use the toothpick test to check for doneness; bake longer if necessary. The top of the cake will be golden brown and will likely develop cracks. Let cool in pan for about 15 minutes, then invert onto a rack to completely cool. Store covered at room temperature. Cake is great to slice and pack for adventures! Triple Chocolate Pumpkin Cake created something of a sensation at my husband’s work. Imagine profanity-laden joyful proclamations about this being the best cake ever. The thing that surprised me most about their feedback was that they didn’t even realize there was pumpkin in the cake. It was all about the chocolate and the sheer moistness of the cake itself. Well, the secret to that tender crumb: canned pumpkin puree. Ta-da! The chocolate IS the star here. 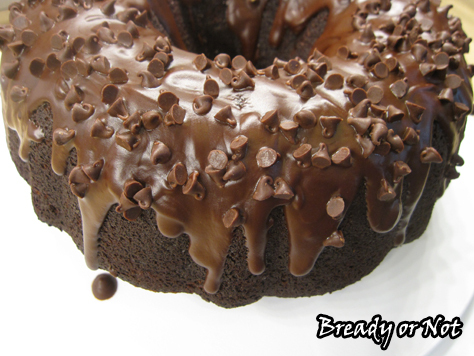 I mean, there’s a reason the name starts with “triple chocolate.” You have cocoa and chocolate chips in the cake, and a chocolate glaze that is also topped with chocolate chips. 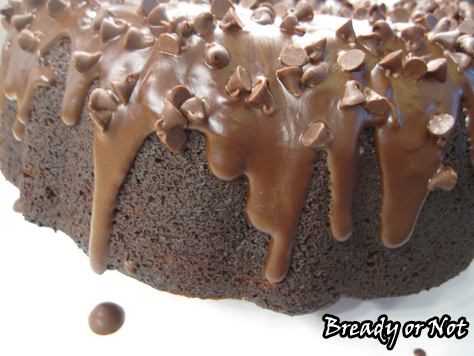 Does that mean this should really be called a “quadruple chocolate pumpkin cake?” Dang it. I’m a writer. Don’t expect me to do math. Modified from A Dash of Sanity. 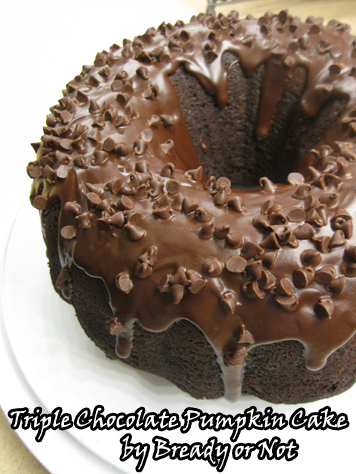 This bundt cake is loaded with chocolate and has an especially moist, tender crumb thanks to the inclusion of pumpkin puree. Some people don’t even realize the pumpkin is in there! Prepare the bundt pan. In the microwave, melt the tablespoon of butter. Stir in the tablespoon of sifted cocoa to make a paste. Use a pastry brush to completely coat the inside of the pan. Set aside. Preheat oven at 325-degrees. In a large bowl, mix together sugar, oil, vanilla extract, and eggs. In a separate bowl combine flour, salt, baking soda, baking powder, sifted cocoa, and cinnamon. Gradually add the flour mix to the sugar mix. Mix in the milk and pumpkin puree. Once everything is just combined, stir in the chocolate chips. 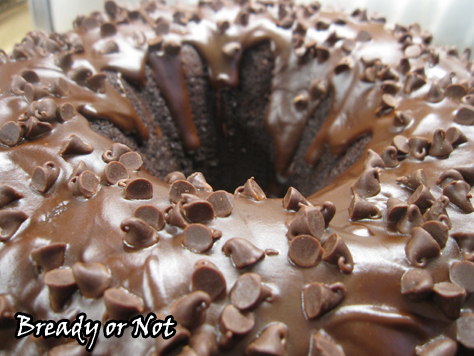 Pour thick batter into the ready bundt pan. Bake for 50-60 minutes, or until it passes the toothpick test. Set pan on rack for about ten minutes and remove pan by upending the cake onto the rack. Let it completely cool. 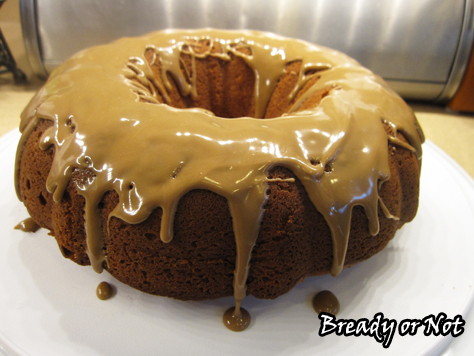 Once the cake is cool, make the glaze. In a small microwave-safe bowl, place the butter, chocolate chips, and corn syrup. Heat for 30 seconds or so and stir thoroughly, then briefly heat again if needed to finish melting. 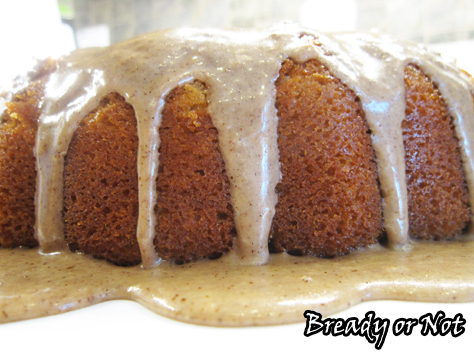 Use a spoon to drizzle the glaze onto the cake, spreading it around as needed. Sprinkle mini chocolate chips on top to finish it off. Set in fridge to set for several hours or overnight--chocolate cakes are better after a day (if you can restrain yourself that long)! CAKE + PIE MONTH continues with another dose of maple–this time in the glaze atop this tender cinnamon-filled bundt cake! If you don’t have maple flavor around, worry not. This cake will be just fine if you use vanilla extract instead. You could always add more cinnamon into the glaze, too, just for a spicy boost. I love using sour cream in cake batter like this. It creates such a tender, moist texture. You can always substitute Greek yogurt for sour cream, too. I spied the original version of this recipe in the Arizona Republic one morning. I knew I had to make it… but I also knew it needed some modifications. 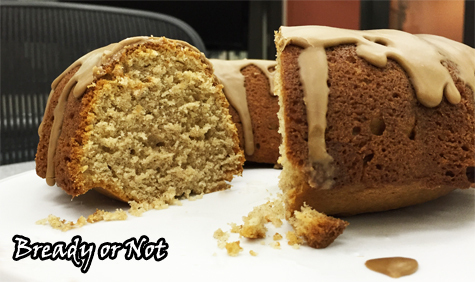 How could it be called a cinnamon coffee cake if it only had one teaspoon of cinnamon? Nope, nope. 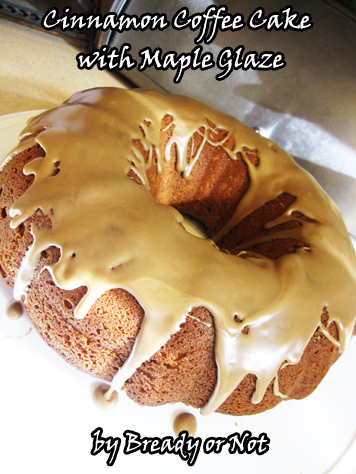 And of course, I had to give it a maple glaze. If you’re getting burned out on maple (*cough*blasphemy*cough*), worry not. 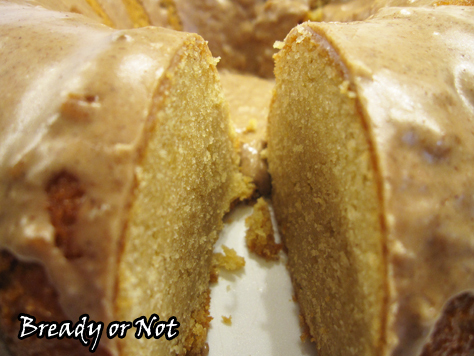 Next week, I finish off Cake + Pie Month with Cardamom Coffee Pound Cake! 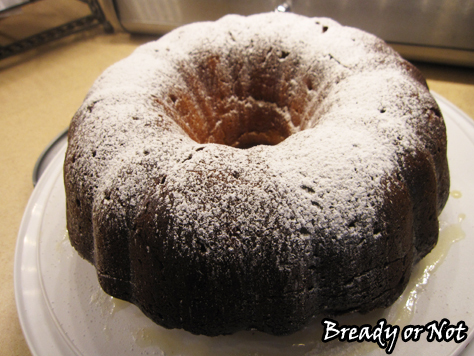 Unlike this week’s recipe, the pound cake actually includes coffee in the batter and in the glaze. But, you know, I think this week’s recipe has a mighty fine glaze as it is. Modified from Sour Cream Cinnamon Coffee Cake in the Arizona Republic, March 16, 2016. 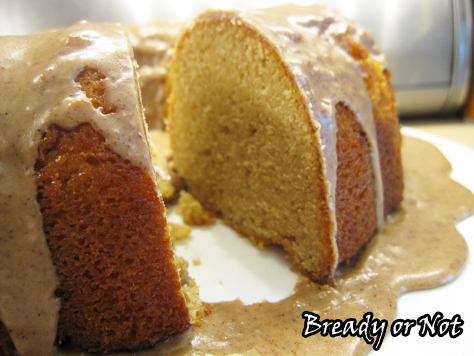 Use a bundt cake pan to bake up an easy and delicious coffee cake! 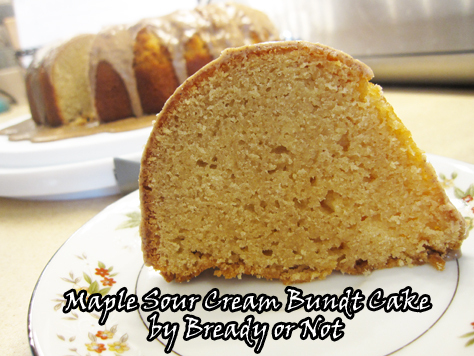 The cinnamon flavor sings through the tender cake and perfectly complements the maple-infused glaze. Modified from Sour Cream Cinnamon Coffee Cake in The Arizona Republic, March 16, 2016. Preheat oven at 350-degrees. Use nonstick spray with flour to thoroughly coat a 9 or 10-inch bundt pan, or use extra butter and a liberal dusting of flour. Discard any excess flour. In a large bowl, beat together the 1 cup butter and the sugar until they are light and fluffy. Add eggs one at a time followed by the vanilla and sour cream. In a smaller bowl, combine the dry ingredients: the flour, baking powder, baking soda, cinnamon, and salt. Slowly combine the two bowls; don't overmix. Scrape the batter into the prepared pan and spread so the top is even. Bake for 45 minutes, or until a toothpick deeply inserted into the cake comes out clean. Let cool for 10 minutes on wire rack, then flip the cake out of the pan to completely cool on the rack. When the cake is completely cool, make the glaze. In a small bowl, stir together the powdered sugar, milk, and maple flavor (or vanilla extract). Add more milk, if needed, for desired textured. Set cake on a serving plate and dribble glaze all over top of cake. For our second installment of CAKE/PIE MONTH, I present a tender, moist pound cake that’s embodied with a fresh lime flavor! To glaze this cake, I tested out a technique I saw on the Great British Baking Show. 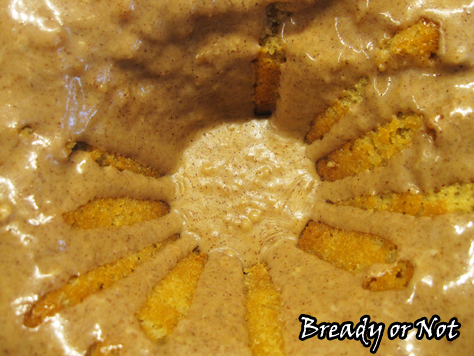 It worked like a charm, and it’s something I’ll do with all of my poke cakes in a bundt pan from here onward. If you haven’t seen the Great British Baking Show (known in the UK by its original moniker of Great British Bake Off), GO SEE IT. It’s on Netflix, YouTube, and the PBS website. This is the show that helped me to survive my edits for Breath of Earth and to write Call of Fire in one month. Not only is it about creating lovely baked goods, it’s about achieving technical, chemical perfection in a reality show environment that is completely positive. No back-stabbing, no contrived drama. The bakers work under an extraordinary time crunch. 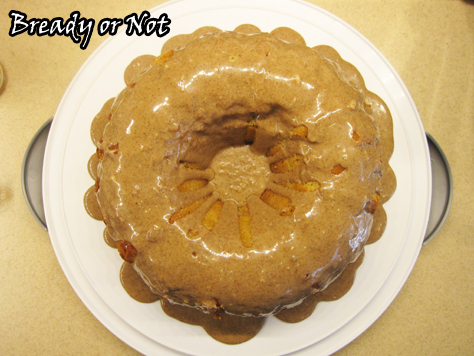 In one episode, a baker needed to glaze a bundt cake very quickly. They poked the cake all over and put it back in the pan to pour the glaze. This way, most of the glaze went INSIDE the cake, as intended for a poke cake, and did not puddle the plate. The technique totally works. My bundt cake was perfectly moist all the way through because the glaze had a chance to soak in from all angles. 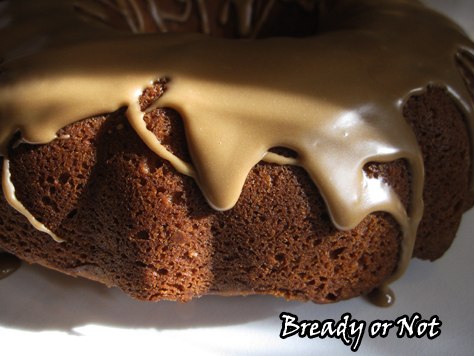 This bundt cake has such a lovely flavor to go along with the moist texture, too. This is the kind of cake that is perfect for breakfast, brunch, or dessert, and is great with fruit, ice cream, or a simple cup of coffee. It would be great to eat while watching the Great British Baking Show. This lime-fresh cream cheese pound cake is perfect for breakfast, brunch, or dessert! If you use a special technique learned from the Great British Baking Show, the glaze will penetrate the cake and make it especially tender all the way through. Modified from Relish Magazine. Preheat oven to 325F. Thoroughly grease and flour a 12-cup bundt pan. 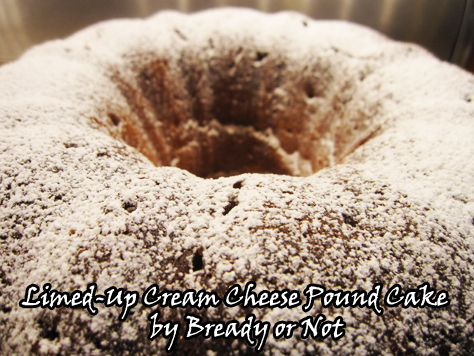 In a large mixing bowl, cream together the butter, cream cheese and sugar until light and fluffy. Beat in eggs alternately with flour, mixing well after each addition. Add salt, vanilla extract, almond extract, and the zest and juice of both limes. Mix until combined, taking care not to overbeat. That could dry out the cake. Pour batter into prepared pan. 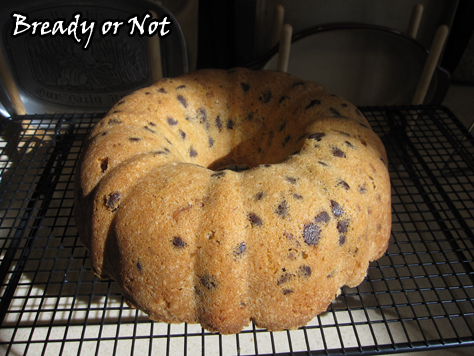 Bake for 1 1/2 hours, or until a tester inserted in the center of the cake comes out clean. Let cool 10 minutes and then plop it onto a rack to cool some more. Don't wash the pan yet! While the cake is still warm, use skewers or chopsticks to poke holes all over the top. Mix the glaze ingredients (sugar, butter, lime juice) in a small saucepan. Bring to a boil for about one minute, then remove from heat. 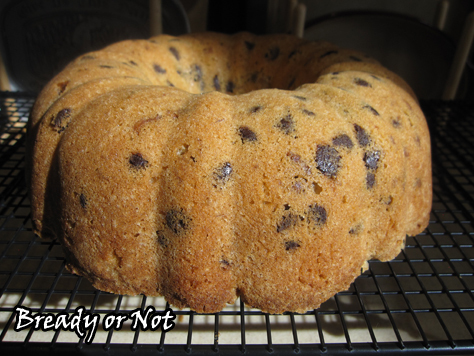 Set the cake back inside the pan; poke more holes in the base of the cake. Slowly pour or ladle glaze over the holes. Let that soak in. Use over half the glaze, then carefully tip the cake onto a cake plate. Slowly drizzle the rest of the glaze into the holes. IT IS BOOK RELEASE MONTH. IT IS CAKE AND PIE MONTH. Oddly enough, the emphasis will be on maple. Gee, you might think I like the stuff. 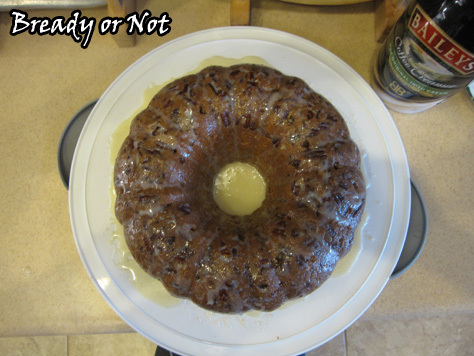 I am starting out with what might be the best bundt cake recipe I have ever made. Yes, it even rivals the infamous Tunnel of Fudge Cake. This recipe is extremely close in flavor and texture to the holy-moley-amazing Maple Walnut Cake, minus the walnuts. The Maple Walnut Cake is stunning to eat but it’s also very time-consuming to make because it’s a layer cake. 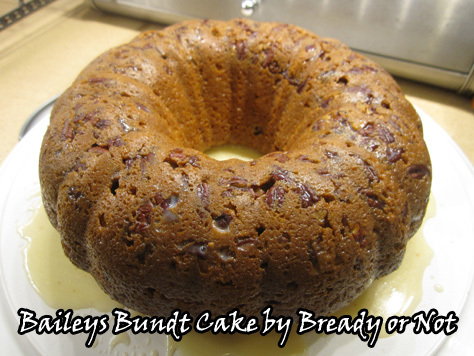 This bundt cake is EASY. It whips together in no time. 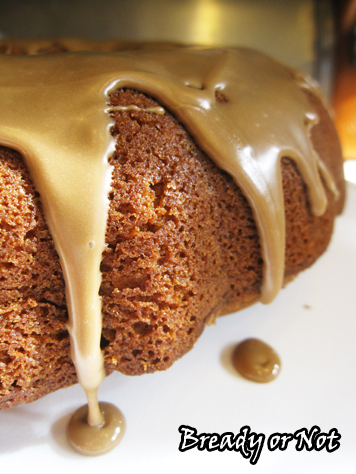 The cake itself is like a moist pound cake–soft, tender, and sweet with maple. I opted for a glaze rather than a frosting. Tweak the liquids to make that as thick as you want, but really, the cake is sweet on its own so you don’t need a big layer here. Some of these pictures look almost pornographic, don’t they? Yes, the glaze is as good as it looks. You can’t go wrong with powdered sugar, cinnamon, butter, and maple flavor. Well. I guess you can go wrong if you’re diabetic. This luscious, amazing cake has the texture of a tender pound cake with an added oomph from a thin maple glaze. 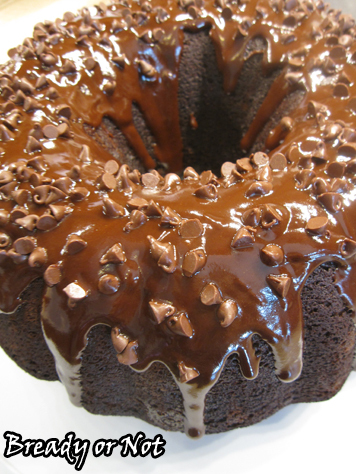 This cake will blow your mind and your waistline! Preheat oven to 325-degrees. 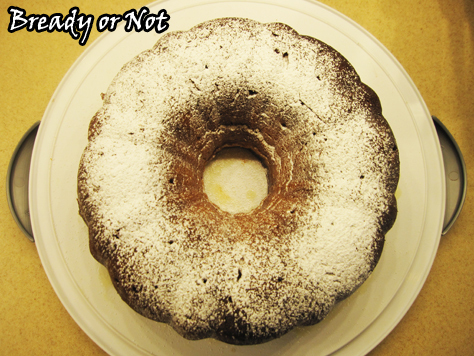 Spray a bundt pan with nonstick spray with added flour, or grease well and sift flour over the surface. In large bowl, beat the butter and sugar until smooth. Add the eggs, one at a time, beating well after each addition. Pour in the vanilla extract, maple flavor, and maple syrup. In a small bowl, sift together the baking powder and flour. Add some of the flour mix to the big bowl, followed by sour cream, going back and forth until all of the cake ingredients are mixed together. 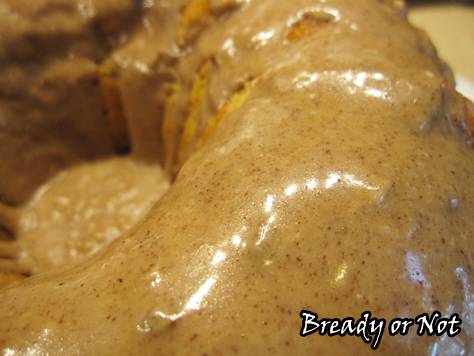 Pour the batter into the prepared bundt pan. Bake for 1 hour, or until it passes the toothpick test. 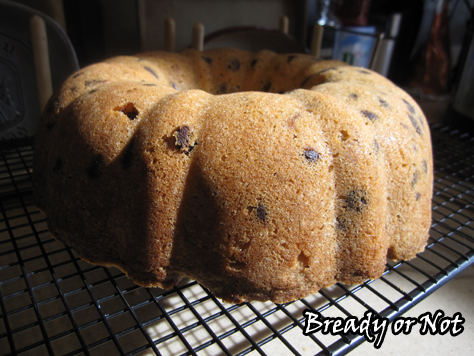 Let it cool for about ten minutes in the pan and then carefully plop the cake onto a wire rack to completely cool down. Once it is room temperature, it's time to glaze. Mix together all of the glaze ingredients together EXCEPT the water. Dribble in the water. Stir well. Add more water if needed to achieve desired consistency. Welcome to part 2 of my St. Patrick’s series as I use up a big honkin’ bottle of Baileys Coffee Creamer! 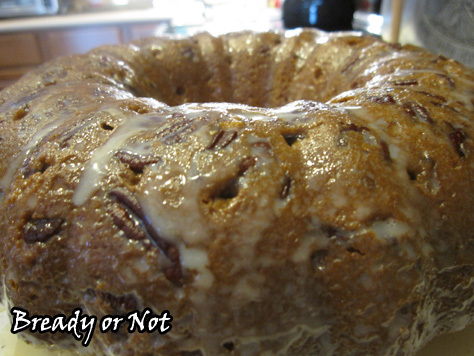 This time, it doctors another cake mix, but in bundt cake form. This is, really, a large pound cake/poke cake. The flavor of Baileys isn’t heavy here at all. It’s all about vanilla smoothness and tender crumb. The glaze isn’t something that sits on top of the cake. It soaks in. You poke it all over and drizzle the glaze on slowly so the moisture can penetrate. 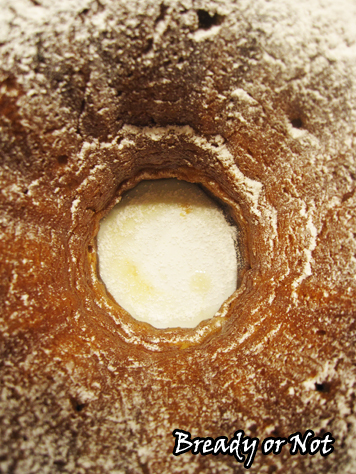 After a day in the fridge, it’s hard to tell it was glazed at all… until you cut inside and see how lusciously moist the cake is inside. This is a cake that’d be great for breakfast, brunch or dessert, by itself or dressed up with fruit or ice cream. You can always make extra glaze for adorning individual pieces, too–the original recipe recommended doing just that. It also used the alcoholic Baileys, so that’s another way to “dress this up,” too. Use the mild-mannered coffee creamer or the harder stuff. Your call. Whatever you use, it’ll make for a yummy, tender cake. 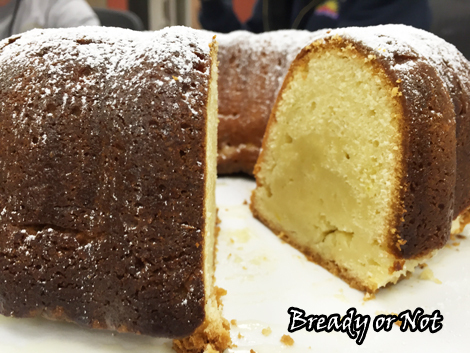 Use standard yellow cake mix and pudding mix to create a tender bundt cake. 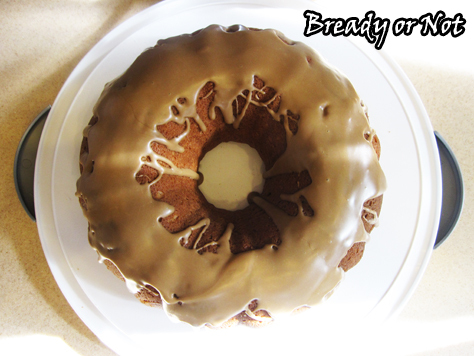 Baileys is in the cake and in the glaze that soaks into the cake, creating something that’s smooth and sweet and perfect for breakfast, brunch, or dessert! Preheat oven to 325-degrees. Generously grease and flour a 10-inch bundt pan. Sprinkle pecans all the way around the bottom. 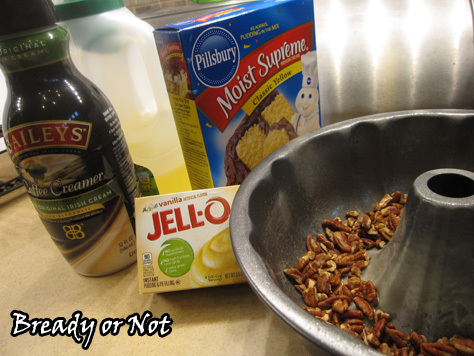 In a large bowl, mix together the yellow cake mix, vanilla instant pudding mix, eggs, water, oil and coffee creamer. Pour the batter over the pecans in pan. Bake for 60 minutes, or until it passes the toothpick test. Let it cool for about 15 minutes then flip the cake out onto a wire rack to cool completely. When the cake is cool, make the glaze. In a small saucepan, combine the butter, water, and sugar. Bring it to a boil and keep it there for 5 minutes, stirring all the while. Remove it from heat and add the Baileys. Poke the cake all over with a skewer of chopstick. Slowly drizzle the glaze over the cake so that the sweetness can soak into the puncture points; a brush is useful here, too. Gradually work all of the glaze inside and over the cake; note that it will soak in more over the next hours and the cake will look moist rather than iced. Store covered in the fridge.